Author and clinical psychologist, Kay Redfield Jamison, writes, “Children need the freedom and time to play. Play is not a luxury. Play is a necessity.” It is through unstructured, open-ended creative play that children learn the ways of the world. While playing outside, children explore with all their senses, they witness new life, they create imaginary worlds and they negotiate with each other to create a playful environment. 1. Outdoor play is a multi-sensory activity. While outdoors, children will see, hear, smell and touch things unavailable to them when they play inside. They use their brains in unique ways as they come to understand these new stimuli. 2. Playing outside brings together informal play and formal learning. Children can incorporate concepts that have learned at school in a hands on way while outdoors. For example, seeing and touching the roots of a tree will bring to life the lesson their teacher had taught about how plants get their nutrients. 3. Playing outdoors stimulates creativity. Robin Moore, an expert in the design of play and learning environments, says, “Natural spaces and materials stimulate children’s limitless imagination and serve as the medium of inventiveness and creativity.” Rocks, stones and dirt present limitless opportunities for play that can be expressed differently every time a child steps outside. 4. Playing outdoors is open ended. There is no instruction manual for outdoor play. Children make the rules and in doing so use their imagination, creativity, intelligence and negotiation skills in a unique way. 5. Playing in nature reduces anxiety.Time spent outside physiologically reduces anxiety. Children bring an open mind and a more relaxed outlook back inside when they are in more traditional learning environments. 6. Outdoor play increases attention span. Time spent in unstructured play outdoors is a natural attention builder.Often children who have difficulty with pen and paper tasks or sitting still for longer periods of times are significantly more successful after time spent outside. 7. Outdoor play is imaginative. Because there are no labels, no pre-conceived ideas and no rules, children must create the world around them. In this type of play children use their imagination in ways they don’t when playing inside. 8. Being in nature develops respect for other living things. Children develop empathy, the ability to consider other people’s feeling, by interacting with creatures in nature. Watching a tiny bug, a blue bird or a squirrel scurrying up a tree gives children the ability to learn and grow from others. 9. Outdoor play promotes problem solving. As children navigate a world in which they make the rules, they must learn to understand what works and what doesn’t, what line of thinking brings success and failure, how to know when to keep trying and when to stop. 10. Playing outside promotes leadership skills. In an environment where children create the fun, natural leaders will arise. 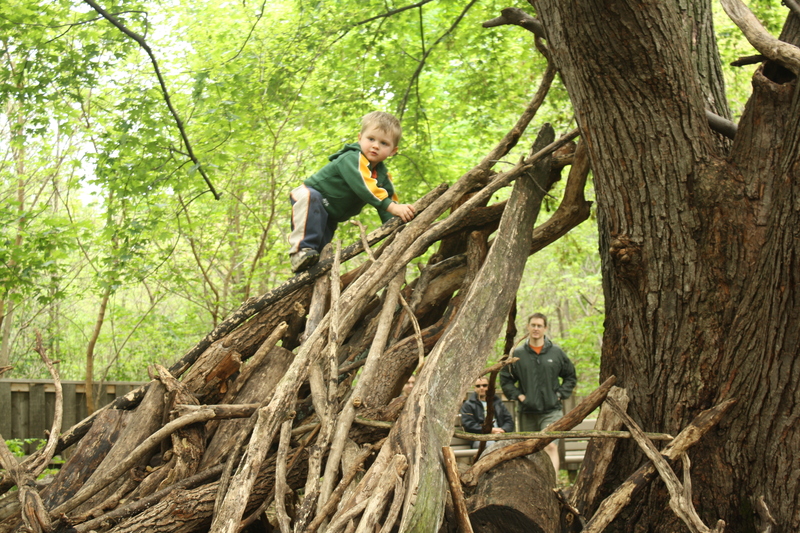 One child may excel at explaining how to play the game while another may enjoy setting up the physical challenge of an outdoor obstacle course. All types of leadership skills are needed and encouraged. 11. Outdoor play widens vocabulary. While playing outdoors, children may see an acorn, a chipmunk and cumulous clouds. As they encounter new things, their vocabulary will expand in ways it never could indoors. 12. Playing outside improves listening skills. As children negotiate the rules of an invented game, they must listen closely to one another, ask questions for clarification and attend to the details of explanations in ways they don’t have to when playing familiar games. 13. Being in nature improves communication skills. Unclear about the rules in an invented game? Not sure how to climb the tree or create the fairy house? Children must learn to question and clarify for understanding while simultaneously making themselves understood. 14. Outdoor play encourages cooperative play. In a setting where there aren’t clear winners and losers, children work together to meet a goal. Perhaps they complete a self-made obstacle course or create a house for a chipmunk. Together they compromise and work together to meet a desired outcome. 15. Time in nature helps children to notice patterns. The natural world is full of patterns. The petals on flowers, the veins of a leaf, the bark on a tree are all patterns. Pattern building is a crucial early math skill. 16. Playing outdoors helps children to notice similarities and differences. The ability to sort items and notice the similarities and differences in them is yet another skill crucial to mathematical success. Time outdoors affords many opportunities for sorting. 17. Time spent outdoors improves children’s immune systems. Healthy children are stronger learners. As children spend more and more time outdoors, their immune systems improve decreasing time out of school for illness. 18. Outdoor play increases children’s physical activity level. Children who play outdoors are less likely to be obese and more likely to be active learners. Children who move and play when out of school are ready for the attention often needed for classroom learning. 19. Time spent outdoors increases persistence. Outdoor games often require persistence. Children must try and try again if their experiment fails. If the branch doesn’t reach all the way across the stream or the bark doesn’t cover their fairy house, they must keep trying until they are successful. 20. Outdoor play is fun. Children who are happy are successful learners. Children are naturally happy when they moving, playing and creating outside. This joy opens them up for experimenting, learning and growing. Bio: Stacey Loscalzo is a freelance writer and mother of two girls living in Ridgewood, NJ. She and her girls have been getting outside to play for nearly a decade. ABOUT THE AUTHOR: Marghanita Hughes is a children’s author and illustrator and creator of the award-winning children’s brand, The Little Humbugs. She is a naturalist and founder of the “Let’s Go Outside” Revolution – a Canadian non-profit organization with a mission to change the way children spend their time. Throughout the year, Marghanita runs nature classes for children and “hands on” workshops for educators wanting to learn how they can connect children with the natural world. She strongly believes that all children should be given the opportunity to discover and explore the natural world. All children deserve the right to have the opportunity to experience the magic that the natural world provides. I am fortunate to be able to witness this magic every day in my nature classes and during the school visits I make. Because of that magic, my life has been transformed. A few years ago, I launched nature classes for 3 – 8 year olds. During the classes, we provide a natural space where children can run, play, dance, sing, squeal, shout or be silent in this forest space. They stand, kneel or crouch to paint or create the creatures, birds, trees, flowers and grasses, which are all around us. The children develop a beautiful relationship with Mother Earth. They get to feel who they are, happy and free. Over the past three years, I have expanded the classes, offering them after school. How did I come to this mission? Throughout life, people come into our lives that help us on our way to finding our purpose in life. Or it may be a book that we read at a particular time in our lives that inspires change in us. One such book for me was Last Child In the Woods by Richard Louv. The very title haunted me. The book had such a profound impact on me that it inspired me to create my nature classes. Now I believe there is a need to provide a way for people of all ages to benefit from nature in their lives. In Richard’s latest book The Nature Principle, he provides affirmation that adults are suffering from nature-deficit disorder, too, and are in need of reconnecting with nature just as much as children. He quotes Thomas Berry: “We have turned away from nature. The great work of the twenty-first century will be to reconnect to the natural worlds as a source of meaning.” This is absolutely true. The Nature Principle led me to add another element to my nature classes: adults. What I try to get across in my presentations to adults and children is that you do not need to be a biologist to teach children about the birds and trees in their backyard or park, or the need to be a life-long gardener in order to grow a small vegetable plot in the school grounds. The simple nature-based activities we teach in my workshops and classes are fun and easy, stimulating the child’s (and adult’s) body, mind and spirit. During my presentation/workshop in Vancouver for the Early Learning Years Conference 2011, I was overwhelmed by the educators’ enthusiasm and their dedication to changing the way children spend time in their care. Witnessing their sense of awe and imagination was both heart-warming and exciting. It was easy to forget I was teaching adults. Typically, I start the sessions by getting participants to close their eyes and to take a moment to think back to their own childhood. I ask them to think of their favorite outdoor activity as a child. The room instantly fills up with smiles and I ask who would like to share their fondest memories. Hands shoot up all over the room, eager to reminisce about their childhood outdoors. Having a room full of happy, enthusiastic teachers, excited to take their new knowledge of how to actively engage children and adults with nature, fills me with an abundance of joy and hope for the future. If a teacher is enthusiastic, he or she will get the children excited too. Since registering as a participant in the Children and Nature Network some time ago, I have watched it grow and blossom into an amazing pulse of creative energy, a network of individuals, organizations and nature groups, sharing and connecting their ideas, dreams, solutions, and challenges: fueling the very movement Richard hoped would happen. In Canada, I’ve been inspired to start what I call The Let’s Go Outside Revolution, a non-profit organization, providing help at the grassroots level — starting locally, growing organically. The response to has been amazing. Here is just one example: An elementary school teacher from Vancouver got involved in our Revolution. At the time, she was the only teacher in her school to take classes out into a little forested area behind the school. In December she reported that every single teacher in her school was now taking their classes outdoors. Yes, there is a long way to go, but a “New Nature Movement,” as Richard Louv calls it, is growing stronger and more powerful every day. We all have a purpose in life. I believe my purpose is to help return our children to Mother Earth and to help re-awaken the awe and wonder in adults who have forgotten or lost their inner child. I am the revolution. You are, too. via ARE SCHOOLS BREAKING CHILDREN’S SPIRITS? Life and Learning Beyond Walls. When starting out as a teacher, I heard Joseph Cornell say that keeping children inside one room five days a week is akin to breaking a horse. I’m haunted by that analogy. Our tendency is to keep children in, especially as academic demands only increase. And for discipline or missed work what do we do? Keep them in at recess. Breaking horses. Audrey was a sixth grade girl in a school with a schoolyard habitat that was used as an outdoor classroom. During science class in fourth grade, her attention was turned to a small, hard, dark woody case surrounding the stem of an oak shrub. It was the size of a marble and was in a cluster of five other small round cases. As she looked to other branches, she noticed that the clusters of balls were quite common all the way through the tangled scrub oak. Intellectually, her curiosity was sparked. Physically, she moved in long graceful strokes along the woods, her breath increasing and diminishing as she found other clusters, feeling the texture of them with her fingers, her notebook tucked under her arm. Emotionally, she felt a sense of excitement build as she realized she had no idea what she was looking at, then wonder as she discovered that the balls were actually wasp galls – hard cases to protect the egg, then larva of the insect. For three years, Audrey visited the exact branch that first caught her attention and taught her classmates about the galls. Jimmy was a sixth grade boy in the same school. He was not interested in the woody galls. One morning in class, Jimmy and his classmates discovered a social trail through the scrub oak woods. The three boys crept carefully into the woods following the barely noticeable trail created by local coyotes or maybe deer. The boys found that the trails wound through the very small patch of woods and that if they entered by the picnic table, they could emerge by the library. Jimmy’s attention was fixed. He went inside at the end of class that day, promptly opened his notebook, drew a map of the trails, and wrote a paragraph about the experience. That afternoon, we went back outside and he explored the woods on his own with a video camera. The footage recorded his decision-making as he whispered to himself when he came to a fork in the trial, his breathing slowing and quickening in tune with the pace of his footsteps in the crunchy snow, and his exclamations when he found something unexpected. Using these two stories out of hundreds collected during an eight-month study of this public, traditional school’s natural classroom habitat, there is evidence that supports children’s embodiment of so much more than intellect! And yet, intellect and critical thinking was still very present in their experiences. Through contact with a natural setting during the school day, the children in 4th-6th grade found imagination and adventure, critical thinking and curiosity, respite and relaxation, peace and calm, and ownership and identity. The outdoor classroom developed the students’ sense of belonging to the school and to the natural world. The contact these children had with nature was also in a place where the children felt safe to explore at a distance from the teachers that felt safe. In some cases, it was the children’s the first contact with nature in a exploratory way. If the question is about providing children with access nature, schools have an answer. Even short, unstructured time in the schoolyard habitat with the sounds, textures, smells, space, and sensations showed value. The children were awake to the world, expanded to their own possibilities of their sensory channels, alive with curiosity and calm. What a gift that schools can provide for an area of childhood that is vanishing at an alarming rate and at the same time, allow for children to feel the sense of wonder and joy in becoming familiar with the natural world. *Mercogliano, C. (2007). In defense of childhood: Protecting kids’ inner wildness. Boston, MA: Beacon Press. We oppose the teaching of Higher Order Thinking Skills . . . critical thinking skills and similar programs . . . which focus on behavior modification and have the purpose of challenging the student’s fixed beliefs and undermining parental authority. The Center for American Progress, a major progressive think tank, recently released a report entitled Increasing the Effectiveness and Efficiency of Existing Public Investment in Early Childhood Education, in which they seem to be calling for us to double-down on the corporate reform education policies of the past two presidential administrations by bringing standardized testing, the de-professionalization of teaching, and federally mandated curricula, all with an economic focus, into kindergarten and preschool classrooms. It’s a report written by two economists and the “money quote” (pun intended) is from yet another economist named James Heckman, this one with a Nobel Prize no less, who warn us once more, breathlessly, that the Chinese are beating us! The report writers say that they “assembled a number of highly respected experts in the early childhood education field, who are listed in the front of this report,” but this reporter has been unable to locate said list anywhere on their website. I really would like to see which “experts” signed off on this nonsense. There are few things upon which the right and left agree in this country, but one of them is to be dead wrong about education policy. But, you know, we keep hearing how both sides are working hand-in-hand on this, in a bi-partisan manner, to bring us schools with lots of tests that focus on “trivia” instead of critical thinking skills, a top-down curricula that mandates what children learn rather than on teaching them how to learn, young, cheap teachers who could have just as easily have been “trained” to flip burgers, and a carrot-and-stick approach to keeping everyone in line. Oh, and spankings will be administered until teh children haz learned. None of this, from either the left or right can be supported by what research tells us about how children learn, brain development, or best practices. None of this supports the purpose of public education in a democracy, which must be civic, not economic. None of this serves children. So as you can see, it’s a sort of win-win for right, left and corporations, leaving students, parents and teachers with even smaller, harder and more sour lemons with which to work. To take a survey of the media landscape, you would think there is very little opposition to what’s going on in the nation’s capitol or in state houses around the country, but you would be wrong. You rarely see “our side,” the side not championed by either of the two political parties, represented in the mainstream media exactly because it is a well-known “fact” that if a point of view is not held by Democrats or Republicans, then it is too fringe-y for serious discussion. Diane Ravitch, an education historian and author, who was appointed to high level education department positions by presidents of both political parties, is one of the few voices regularly included in the national debate. I admire Ms. Ravitch immensely, as I do other champions for real education reform such as Washington Post columnist Valerie Strauss, EdWeek bloggers Anthony Cody and Nancy Flanagan, founder of Parents Across America and Class Size Matters, Leonie Haimson, director of Race To Nowhere Vicki Abeles, teacher and blogger Dave Reber, and the good folks at both the Rethinking Schools and Shanker Blogs. There are hundreds of other voices out there as well, many probably more worthy of my list, doing the good work even if we rarely hear their voices outside the blog-o-sphere. And it’s adding up. Arne Duncan has complained about the “bloggers” who are opposed to his plans. Bill Gates (the most prominent of the corporate reformers) has called us his “enemies.” Despite our invisibility on the national stage we are being at least somewhat effective in pushing back as a grassroots movement outside the confines of the two-party system, but so far they see us as more of a nuisance than a real political force. There are a lot important issues that need our attention, I know, but this is a biggie. Without higher order thinking skills we’re lost. This is a call to get involved, not just for your children, but for the future of America. Read these writers, write those letters, run for office, let your representatives know you will vote on education issues. We can’t let the spankers and the testers win. NATURE PLAY AS AN EVERYDAY JOY OF CHILDHOOD? By focusing your primary efforts on creating multiple micro-habitats, you will ensure authentic nature play: interactions with real nature, in all of its beauty, wonder, unpredictability, and adventure. Manufactured outdoor play components – like the plastic play equipment designed to look natural – do not create the same connections to the natural world. Kids can’t peel the bark off a plastic log to find rollie-pollies, and they won’t find monarch caterpillars feeding on fiberglass leaves. 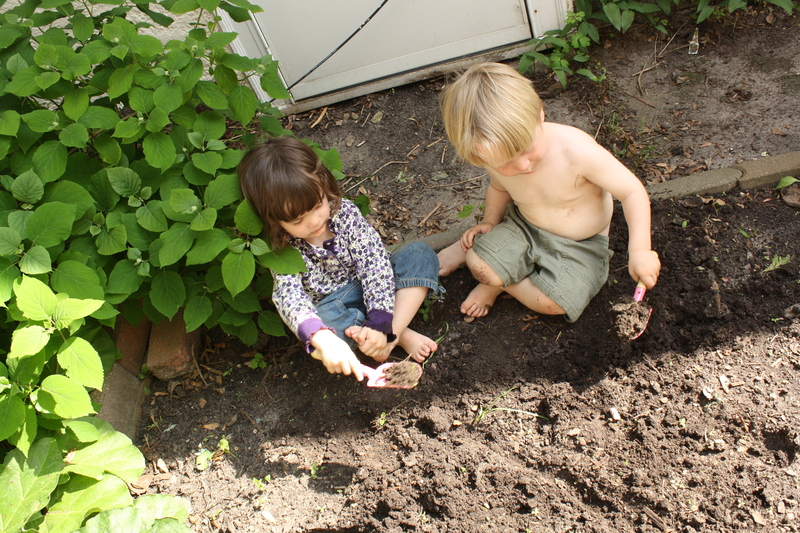 In fact, one big, over-grown wildflower bed — or a patch of flowering shrubs laced with tiny paths — will bring more lasting and real nature play to your kids than will any human-made product!